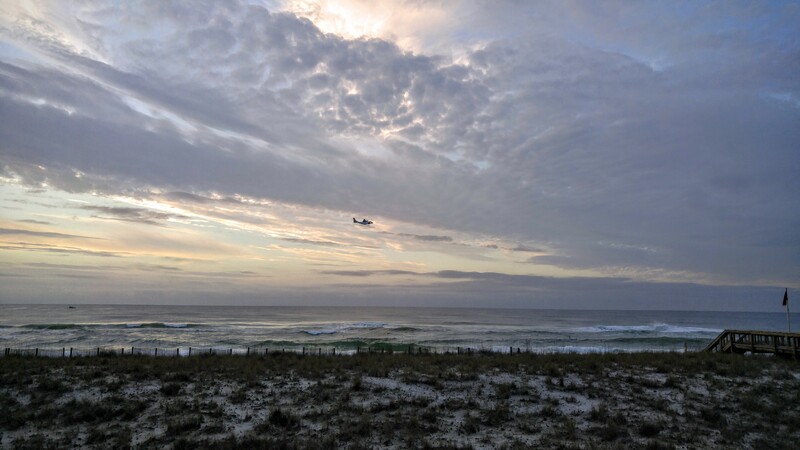 I awoke this morning to the sounds of low flying airplanes, and boat engines…little did I know what was happening right outside our back door here in Florida’s “Best Kept Secret”, Navarre Beach. Sometime after 3:30 a.m., a young couple staying a few doors down went for an early morning swim. He never returned. Emergency responders were dispatched to our little slice of the Gulf before dawn, and all day there have been boats, planes, helicopters, 4 wheelers, Navarre C.E.R.T.volunteers, U.S. Coast Guard, Police, and Fire searching, combing beaches, watching for any signs of the 28 year old male. Red Flag warnings have been in effect since our arrival, indicating rough waters, high surf and strong rip currents. Still, we often fail to heed warnings…Just last week, on Christmas Eve a 51 year old experienced Stand Up Paddle Board Surfer was lost to rough surf…only to have his body recovered yesterday, washed up on Okaloosa Island 3 days later. I’m reminded to appreciate the moments. I’m reminded to be grateful for every breath. I’m reminded to withhold harsh judgement. I’m reminded that we are all guilty of bad judgement at times. I’m reminded some of us are luckier than others. I’m reminded there’s a family out there holding a prayer vigil, just steps away from the Gulf’s longest pier. I’m reminded, once again, that Life is Short. Previous There is peace, even in the storm. Life is very short. I feel I have blinked too often, because it’s going by so fast.